Jim Sisko has become one of the most sought-after teachers, and performers in the Northwest. The Jim Sisko Quintet has been featured at countless festivals and concert venues, including the Port Townsend Jazz Festival, Bumbershoot, The Art of Jazz Series and Jazz Under the Stars. He has performed with The Glenn Miller Orchestra, Natalie Cole, Barry Manilow, The Manhattan Transfer, and the rock band Yes to name a few. 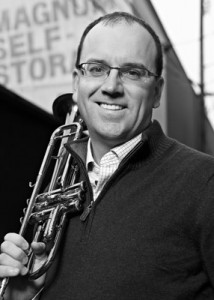 Jim has served as principal trumpet for the Yakima Symphony and has performed with the Seattle Symphony as well. He can be heard on over 40 motion picture soundtracks, and many independent c.d. projects. Sisko’s trumpet students are well versed in both classical and jazz styles and are consistently recognized as some of the strongest players in the region. Jim has served as a Camp Director for Jazz camps throughout the Northwest and is currently the director of the Shoreline Jazz Camp. In addition to his home teaching studio, Jim is the director of the Instrumental Music program at Bellevue College and is the director of the award-winning Bellevue College Jazz Bands.